hi- after a week of exploring less common greens I made a basic spinach/ baby spinach/ silverbeet (chard), English spinach green smoothie this morning with the usual essential fillers- cucumber, frozen mango, ginger, coconut oil, ground chia, koji berries, lime, lemon and a pear and also a couple of dates to counteract too much of the really zingy fresh young ginger. When you google “spinach” it is not surprising you get over 9 million hits- compared to beetroot greens- 241,000 hits…and they almost nutritionally equal!! Spinach is the most well-known green because you will always find it in the supermarket with the salad and Asian greens which are also great basic green smoothie ingredients. Recently baby spinach has become more popular since the introduction of pre washed bags- a 100 gm bag is around 2 handfuls. Raw spinach is packed with calcium, iron, zinc, fibre, protein, vitamins A, C, E, K, B1 thiamin, B2 riboflavin, B3 niacin, B6 pyridoxine, folate, anti-oxidants, magnesium, phosphorus, potassium, copper, lutein and manganese. Which all means- preventing osteoporosis, heart disease, colon cancer, high blood pressure, arthritis, memory loss and cataracts/macular degeneration. Spinach is usually eaten cooked with a substantial loss in nutrients and there have been countless campaigns trying to get kids to eat their spinach as the standard green- with not much success I am guessing. It’s accessibility makes it the perfect green to use in green smoothies when you want to give a newbie -young or old their first taste- because it has no over-whelming taste at all really. It takes on the taste of whatever you add to it in your smoothie. 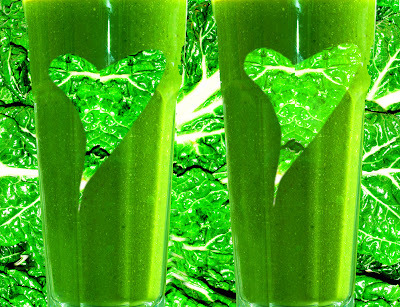 I don’t think I will ever enjoy cooked soggy spinach again after knowing what spinach tastes like in a green smoothie.